If you had suspected that evangelical Christianity promotes sexual purity as an ideal that only women are responsible for upholding, then the exposure of Patrick Henry College's systemic sexual assault college will not come as a surprise. The New Republic has an anger-inducing report on the issue, wherein reporter Kiera Feldman interviews several former students who were sexually assaulted by their male peers, and then blamed for what happened, mainly by Sandra Corbitt, the Dean of Student Life at the private Christian college. When Claire told Dean Corbitt what had happened in John's car that night, she says, "it felt like I was just talking to a brick wall." The administration "basically told me that they couldn't do anything because none of the details of my story could be proven." It seemed to her that the school was far more concerned about her underage drinking than it was about an allegation of sexual assault. Corbitt forced Claire to call her mother to tell her she was in trouble for alcohol—and told Claire to be careful because she had put herself on the dean's "radar." Claire says PHC administrators never mentioned the possibility of involving the police. The administration was supposed to be a second parent, Claire says, but "they didn't take me seriously." In the spring of 2008, another young woman who spoke on the condition of anonymity says she made a sexual-harassment report to Corbitt. A male student was sending threatening messages, including an e-mail that conveyed that "he wanted to forcibly take my virginity," she says. When she met with Corbitt to show her the e-mail, the student remembers the dean saying, "The choices you make and the people you choose to associate with, the way you try to portray yourself, will affect how people treat you." In subsequent meetings, the student says Corbitt told her to think about her clothing and "the kinds of ideas it puts in men's minds." Underlying homeschooling culture is the Christian patriarchy movement, which teaches that men and women have separate, "complementarian" roles: A woman's highest calling is as a mother and submissive "helpmeet" to her husband, who in turn functions as God's representative on Earth. Responsibility falls disproportionately to women, who are taught to protect their "purity" and to never "tempt" their brothers in Christ to "stumble" with immodest behavior. "The lack of men's responsibility or culpability for their own actions and the acceptance of male 'urges' as irresistible forces of nature is the understructure of Christian modesty movements and their secular counterpart," the journalist Kathryn Joyce wrote in Quiverfull: Inside the Christian Patriarchy Movement. These movements, she noted, see "women's bodies as almost supernaturally perverse and corrupting." As a result, when male students have assaulted their female peers, Corbitt has had the power given to her by Patrick Henry College's administration, donors, parents of students, the entire structure, to blame the women who come to her for help. Furthermore, Patrick Henry College does not accept federal funding, leaving this women no recourse with the government under Title IX or any other law after their college has failed them. 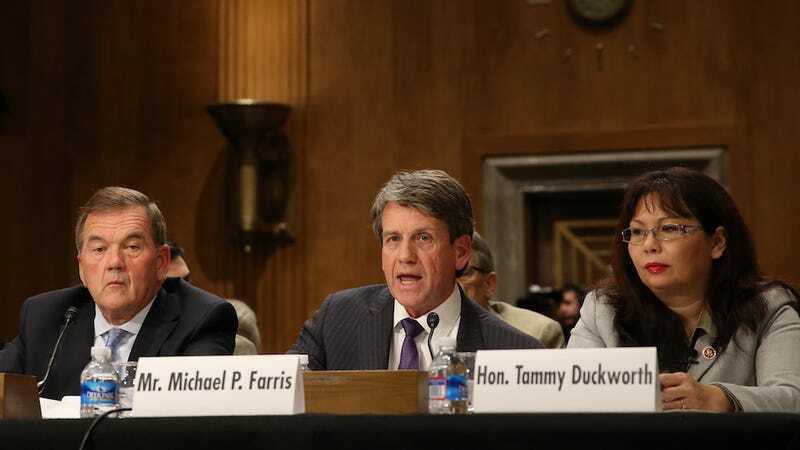 The irony is that Patrick Henry College, aka "God's Harvard," is considered a feeder school into the highest positions of many top government agencies (to get a taste of its influence, check out a photo of founder Michael Farris testifying at a Senate hearing above). Not only are good Christian sexual assault perpetrators shaking off any consequence and then landing an influential job on a national level, but their female victims have dropped out or have understandably alienated themselves from these networks and what they stand for upon graduation. What Patrick Henry College is doing has consequences beyond this campus. In response to a seven-page list of questions, PHC sent The New Republic a five-page statement, emphasizing, "We do not seek to elevate one gender above the other, but rather esteem all students as being made in the image of the One who created the world." PHC objected to the nature of The New Republic's questions, saying they wrongly assumed that "the College views women who, sadly, have experienced sexual abuse or harassment as somehow having been deserving of their fate." The school categorically denied engaging in victim-blaming: "We believe it is offensive to suggest that a person who has been assaulted was somehow 'responsible' for the crime that has been perpetrated against them." So if PHC does engage in the behavior that Claire Spear and other women have said that they do, then somebody there knows that such behavior is wrong. They've basically admitted how flawed Christian courtship culture is, especially when it enables men to commit sexual assault without any repercussions.